Are you interested in doing meditation teacher training? What the most popular types of meditation teacher training you can learn are. The original meditation which has been overlooked yet is now making a come back. How a new meditation can release your body’s natural stem cells and help heal disease. Studies show meditation reduces stress, relieves anxiety, promotes emotional health, enhances self-awareness, increases your attention span, improves memory, and more. With demand for meditation increasing, more and more people are taking courses in meditation teacher training. However, when you want to do meditation teacher training, you first need to know what type of meditation you can teach. There are more than 30 different types of meditations you can learn. In this article we’ll go through the most popular ones. A stressful lifestyle and environment can cause you to overreact to stress and feel overwhelmed. You can lose touch with your body and your mind takes over. And you can get obsessive thoughts about something which happened to you in the past or future worries. Mindfulness helps combat this as it enables you to be fully present, aware of where you are, and what you’re doing. You already possess this ability, however mindfulness helps you to access it. Mindfulness meditation brings more awareness into your life. It helps you stop being judgemental which in turn reduces stress, and enhances performance. Studies show it has positive benefits for our health, happiness, work, and relationships. By clearing your mind, it can give you insights and new perspectives on challenges you may be facing and make you more creative. Practising mindful meditation when lying down can make you fall asleep. So it’s best to do it using proven techniques like when seated, walking, standing, and moving meditation, as well as with other activities like yoga or sports. Transcendental Meditation has gotten a lot of publicity as celebrities like Jennifer Aniston, Russell Brand, Cameron Diaz and Ellen DeGeneres practice it. Developed by Maharishi Mahesh Yogi, transcendental Meditation is a simple, natural and effortless way of letting your mind settle down. Practised correctly, you can transcend the moment and enter into a calm and wise state of rest. Although the use of mantras isn’t at the core of Transcendental Meditation, chanting mantras are involved. “Mantra is a specific thought which suits us, a suitable sound for us which we receive from a trained teacher of Transcendental Meditation. Such is its effectiveness, Transcendental Meditation has been proven to improve your blood pressure, immune system, eating habits, and sleep. And by quieting your mind it clears brain fog to give you more mental agility and clarity. This is why yogis claim Transcendental Meditation makes you more efficient as you access the wisdom of your mind. Guided visualizations are popular because the instructor does the work for you. This has the advantage of letting you follow their lead and let go even more. The teacher is in complete control of the process which makes it easy to teach, as opposed to needing the student to focus, which can be challenging, especially if they’re beginners. With a calm, soothing voice you give directions on how to relax both their mind and body. Visualizations typically involve a peaceful scene in nature, a healing light, or for you to see yourself achieving a goal. You can also repeat affirmations to reinforce good emotions. Guided visualization meditations help lower blood pressure, reduce the levels of stress hormones, and energize you. And as they include visualizations, they can also help you to achieve your personal or professional goals. For example, athletes use guided visualization meditations to see every detail of their race or game beforehand. This helps them to improve their skill and increase his performance. At a more personal level, if you want to build your confidence, you can visualize yourself being more confident in a situation which normally makes you feel uncomfortable. People who practise guided visualization meditation say it helps them get in touch with their intuition and find solutions to problems. There are many types of Buddhist meditation, all of which center around mindfulness. Zen meditation involves using specific postures, as well as learning about its rich and interesting history. Its benefits include increasing awareness, tranquility and insight. This is why Buddhists say this form of meditation helps them to understand their minds and emotions better which leads to greater well-being and happiness. This leads to greater feelings of well-being and happiness for ourselves and those around us which promotes feelings of compassion and love. Buddhist meditations are based on Buddha’s Four Noble Truths which cultivate awareness and train the mind to bring freedom and end suffering. Your body: what you can feel with your senses in the moment. Your feelings: how you feel about what you perceive, and if you can accept them. Your mind: your emotional reactions and thoughts. Phenomena: the nature of your perception of things. Although both forms of meditation contain mindfulness, they’re are distinct in their own ways. Mindfulness meditation is about non-judgmental awareness of what you’re experiencing in the moment. For example, by focusing on your breath to keep the mind focused and aware. However, Buddhist meditation has a more philosophical emphasis. It focuses on ending suffering and confusion, and becoming free. For example, before meditating you take a moment to reflect on your reasons for meditating, and then do so again afterwards. And, although you don’t have to be a Buddhist to practice it, Buddhist meditation involves a religious element as you say a prayer before and after meditating. Osho dynamic meditation involves physical activity like walking or even dancing. Teachers of this meditation believe this breaks old, ingrained patterns in your bodymind which are keeping you stuck in the past. So you can reach an inner silence and peace and become free. This meditation lasts an hour and has five stages. You can do it alone, or with others. Using your breathing, you build up energy inside you and then let yourself go wild. You can scream, shout, sing, dance, and move your body in anyway you want. And then you shout the mantra, ¨Hoo!¨ and stop all movement. Afterwards, you celebrate your revitalized feeling with music and dance. Although the meditations mentioned above are the most popular. It doesn’t mean they’re the best. Soma breathwork meditation is a new type of meditation teacher training you can do. This type of meditation teacher training is one of the most beneficial types of meditation you can do from an emotional, spiritual and overall health perspective. Although you may not know much about it, soma breathwork meditation was the original way to meditate. This is because it’s a combination of Pranayama, the formal practice of controlling your breath which goes back to ancient times, and meditation. In the yoga tradition, your breath is said to carry your life force or prana. 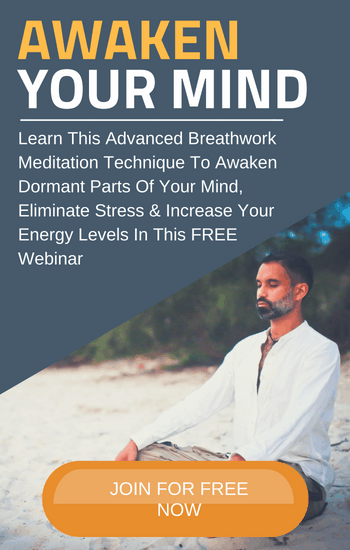 Soma breathwork meditation shows you how to tap into this and transform your health. What this means is every time you inhale, oxygen combines with glucose in the mitochondria of your cells to produce carbon dioxide, water and ATP energy. And when you exhale, you breathe out the carbon dioxide and water. It’s important to have the right balance of oxygen, as too much can cause oxidative stress which can lead to inflammation and cell damage. In what’s called the Bohr effect, you need the right amount of carbon dioxide so you can release oxygen, normally bound to haemoglobin, into your tissues. Your breathing is largely controlled by your involuntary nervous system. When you’re feeling stressed, your involuntary nervous system becomes more active causing you to shallow breath or hyperventilate. This means you don’t have enough carbon dioxide and have too much oxygen bound to haemoglobin so not enough goes into your cells to create energy. Deep inhalations stimulate your sympathetic nervous system which is responsible for the fight or flight response. And when you exhale, you stimulate the parasympathetic nervous system which promotes rest and digestion. This means when you change the way you breathe, you can consciously control your involuntary nervous system and activate either the parasympathetic and sympathetic nervous system. Soma breathwork meditation energizes your body as you inhale more oxygen than normal by breathing rapidly. While breathing slower and longer on the exhale raises your levels of carbon dioxide and dilates your blood vessels by stimulating nitric oxide. The has a relaxing effect on your body. When you experience trauma, negative emotions become trapped in your body. You can carry these negative emotions around for years, even decades, later. This means past trauma, going back as far as your childhood, can hold you back from achieving inner peace and happiness today. Soma breathwork meditation can help you break free from any trauma you’re still unconsciously holding onto. It hyper-oxygenates your body, as you inhale more oxygen and exhale more carbon dioxide than normal. When you do this, you experience a tingling sensation as the pH of your blood changes. This charges the current flowing through your body and strengthens your electromagnetic field. This in turn increases your vibrational and emotional energy which cleanses your body of negative emotions you’ve been subconsciously holding onto. The breathing in soma breathwork meditation causes what’s called vasodilation. This is where improved circulation assists in the growth of new blood vessels which can also increase the production of more capillaries between your veins and arteries. This means soma breathwork meditation greatly improves your heart’s ability to pump blood throughout your body. This improved functionality combined with the production of more red blood cells and new blood vessels also improves your overall level of fitness and stamina. There’s been increased studies into stem cells in the last decade. And for good reason, they can heal illnesses like spinal cord injuries, type 1 diabetes, Parkinson’s disease, amyotrophic lateral sclerosis, Alzheimer’s disease, heart disease, stroke, burns, cancer and osteoarthritis. Soma breathwork meditation actively releases stem cells, through a process called intermittent hypoxia, within your body to both heal your body and make you live longer. Through soma breathwork meditation you can focus your intention on the area you would like to heal. This then tells the body to move the stem cells to the area where they morph and turn into cells needed to repair organs. Soma breathwork meditation improves your overall blood flow and gives you improved functionality within all organs in your body. And as your brain uses a lot of oxygen it also improves cognitive function, and memory. Soma breathwork meditation is the original pranayama and yoga teachings before they got turned into gymnastics and acrobatics. Traditional yoga which originated many 1000s of years ago was intended to be a static work out. You are supposed to hold each pose till exhaustion and incorporate breath control and retention techniques. You also contract muscles throughout the workout cutting off the blood supply to the muscle. However many of the Westernized versions of Yoga which involve flowing from one pose to the next are aerobic workouts which are more aligned with gymnastics and acrobatics, far from what the real purpose of Yoga I have discovered actually is. Strength is one of the cornerstones of fitness. It leads to more resilience to stress and the symptoms of aging. You more energy and better mood as you produce feel good hormones like dopamine and serotonin and with less susceptibility to issues such as osteoporosis and arthritis. You also become more efficient at burning oxygen so your endurance increases and so does your resistance to oxidative stress. This means you have less risk of degenerative diseases and your cardiovascular health improves considerably. If you already teach yoga, reiki, massage or meditation, soma breathwork meditation is a great way to grow your practice. And even if you’re starting out, it’s a great way to offer people something new and stand out from the crowd. Discover how to become a soma meditation teacher here.